Short Mountain Trading Post: Looking for Farmer's Market participants, Flea Market vendors and local craftspeople. To sign up: contact Savannah at 615-464-7824. Free spaces available. 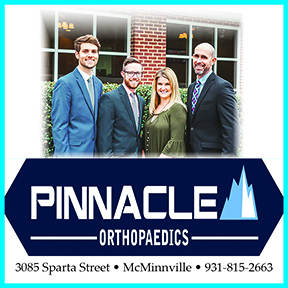 Dr. Trea Wessel of Cannon County Chiropractic will be educating the public 30 minutes at a time on Tuesday, October 7 at her office located at 824 McMinnville Hwy. in Woodbury. The topic for Tuesday's meeting is Chiro 101. Attention all merchants! A meeting will be held on Tuesday, October 7 at the Courthouse at 6:00 p.m. The purpose of this meeting is to discuss plans for the Merchants Country Christmas Open House which will be held on November 21 and 22. Everyone wishing to participate are encouraged to attend. Bring your ideas and work together to make this one of the most profitable days of the year for the merchants. This event brings in people from other counties and we want to enrice their business for the entire year. Contact Jennings Jewelers at 563-2421 or The Chamber of Commerce at 563-2222 if you have any questions. The next big event coming to the Short Mountain Trading Post is the Spooktacular Fest and Fall Flea Market. It is scheduled for Oct. 11 on Saturday from 10 to 5. All our vendors will be dressed in costumes and offering free candies and snacks to our young trick or treaters. kinda like a trunk or treat event, but even more fun!! Make sure you come dressed in costume and win the prize in different categories (to be announced). Enter the pie eating contest. Take a ride on the mule wagon to and from the Distillery. Free space is offered to those wanting to vendor at the flea market. Call Savannah at 651-464-7824 for information. Held on the Square in Woodbury, 3 til 6:30 p.m., contact the Chamber of Commerce at 615-563-2222. Hollow Springs Community Church will hold its annual Fish Fry Saturday, Oct. 11 at 5 p.m. Cost is $5 per plate with all proceeds going to the Nashville Rescue Mission. To go plates are available. Clearfork Methodist Church, 1721 Big Hill Road, Gassaway, will be having a Catfish Dinner on the second Saturday of the month, October 11 from 3:00-6:00 p.m. There will also be the annual fund raiser auction beginning at 6:30 p.m. The 34th annual Clem and Margaret-Wilson Rogers reunion will be held on Saturday, October 11 at the Lions Club Building in Woodbury. The day will get started at 11:00 a.m. Bring a favorite covered dish or two and join us for a day of family celebration. The covered dish lunch will be held at noon. Please arrive prior to that time to get registerd and counted for our "Most Family Present" award. We will also be having our usual awards and games. Please bring a prize to be given awy in the "Bingo" games. Drinks, ice and table service will be provided. Please contact me prior to the reunion about any family news, deaths, etc. The Womack Reunion will be held Sunday, October 12 beginning at 12:00 noon until ? at the Woodbury Church of Christ Fellowship Hall. Bring a covered dish, all your family and any old pictures you have. Call 615-563-4310 for any additional information. The Carson & Barnes Big Top Circus will be at the Arts Center, sponsored by The Chamber of Commerce. That's the sentiment that until recently was painted on the side of the old Holmes Service Station in the heart of Readyville, now owned by Nora and Dave Robinson, a sentiment that is shared by all of those so fortunate as to call Readyville home. Its natural beauty is appreciated at a distance daily by the thousands of drivers who traverse the John Bragg Highway which runs just over a mile to the south. But the vast majority of them are totally unaware of the prominent place Readyville's founder, Charles Ready, and his descendaents have played in county, state, and national affairs. Such will be the topic as Boyd Barker, himself a direct descendent of Mary and Charles Ready, discusses the beautiful place he calls home, and the contributions of its founder and several Ready descendents. Civil War generals, a son who was a U. S. Representative, and a granddaughter who was the envy of the social elite in Washington, DC are just a few of the individuals who will be discussed who have a direct connection to Charles Ready and his Readyville. Gathering time is 6:30 p.m. on Thursday, October 16. The presentation begins at 7:00 p.m. at Goodness Gracious at the Readyville Mill, 5418 Murfreesboro Road, in Readyville. RSVP by October 10. Seating is limited so call 615-409-6009 or 615-563-8088 or janebcr@aol.com. "Monty Python's Spamalot" at the Arts Center of Cannon County. Lovingly ripped off from the classic film comedy Monty Python and the Holy Grail, Spamalot is the award-winning Broadway musical with a book and lyrics by Eric Idle and an entirely new score created by Eric Idle and John De Prez. Show dates and times are Oct. 17, 18, 24 & 25 at 7:30 p.m. and Oct. 19 & 26 at 2 p.m.
and Friday, Oct. 24 and Saturday, Oct. 25 from 6:30 to 9:30 each night. Cost is $5 per person. Refreshments are available in the kitchen. Several downtown businesses are combining efforts for a Fall Festival. Entertainment will include CCHS Jazz Band, performers from BirdSong Studioes, Kevin Quarles and fiddler Lightning Jack. Sponsors include Antiques and More, Jennings Jewelers, Antiques on the Squard, the Old Feed Store and Reed Furniture. (615) 837-5197 or tnagmuseum.org. Planned events include molasses cooking and tasting, bluegrass and country music, free wagon rides and childrens' activities including goat milking. The Foothills Crafts will have their Christmas Arts & Crafts Festival on Friday, November 7 from 9:00 a.m. until 5:00 p.m. and Saturday, November 8 from 9:00 a.m. until 5:00 p.m. This 29th annual sponsored event will be held at the Manchester-Coffee County Conference Center, 147 Hospitality Boulevard (off I-24 Exit 114) in Manchester, Tn 37355. Contact Phyllis Dix at 931-728-0509 or Luise Richards at 931-454-1090. Free parking and free admission. Christine and Alvin Barrett of Woodbury will be there with women and men's jewelry. Cannon County Country Christmas Merchants Open House on the Square in Woodbury. Contact the Cannon County Chamber of Commerce at 615-563-2222 for information.